The Deputy National Organiser of the National Democratic Congress (NDC), Joshua Hamidu Akamba, has predicted the party’s ongoing presidential primary will end with former President John Dramani Mahama capturing not less than 98% of the ballots to lead the opposition party at the 2020 polls. He was speaking to journalists Saturday in the Upper East region where 11, 673 delegates are expected to turn out at 15 election centres to determine who among seven candidates— John Dramani Mahama, Ekow Spio-Garbrah, Sylvester Mensah, Joshua Alabi, Augustus Tanoh, Alban Bagbin and Nurudeen Iddrisu— becomes the party’s presidential candidate. “I expect John Mahama to win convincingly, not less than 98%. That’s what I expect to see. It makes it easier if His Excellency John Dramani Mahama wins. What makes it easier is that he was the President. “If Honourable Bagbin wins, if Honourable Sly Mensah wins, if Honourable Joshua Alabi wins, if any of them wins, they would be looking for the support of His Excellency John Dramani Mahama to be able to win because of the achievements that he has left. So, if the man is already in the game, why do you go looking for somebody else? He has already delivered and he was only exited through deceit,” Mr. Akamba told the press in Bolgatanga. The Deputy National Organiser also delivered an attack on the ruling New Patriotic Party (NPP), saying it lied its way to power by making some promises to Ghanaians before the 2016 polls but failed to fulfill them after capturing power. “The people have lied their way: one district, one factory. And they started doing that because His Excellency John Dramani Mahama started reviving some of the factories. ‘So, what do we do? Let’s convince Ghanaians that we can build them factories in every district’. One village, one dam. At that time there were some de-silting works happening already. So, they said, ‘Okay, no, we will forget; we’ll convince Ghanaians that we’ll give them new dams. “Then, they promised Ghanaians that in every constituency one million dollars. They were making the promises because they were afraid of John Mahama. So, they’ve succeeded. Ghanaians have seen that it’s a lie,” he stated. So far, the electoral exercise is progressing peacefully in the region. 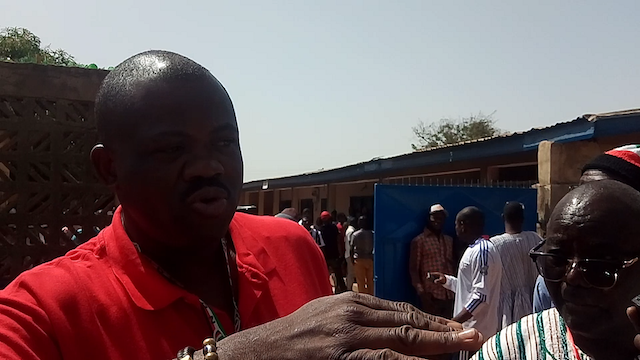 Interacting with the newsmen, the NDC’s Bolgatanga Central Constituency Chairman, George Ayanoore, pointed at the “smooth running” of the polls in his area as a strong signal to the NPP that the NDC was going into the 2020 general elections a more organised party than the NPP.